I have a fairly extensive library of books and field guides on just about every subject you can think of that relates to the natural world—from geology to space to weather to worms to seashells. I even have a field guide to fields! Many of them really don’t lend themselves to reading cover to cover, but I’m reading one now that I am thoroughly enjoying. And I really like the looks I get when people see the title. 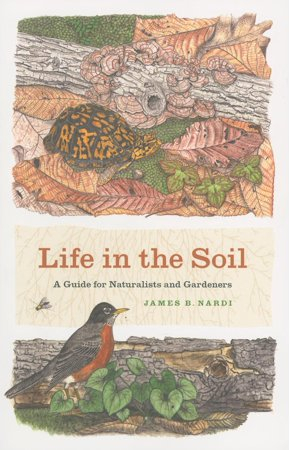 It’s Life in the Soil: A Guide for Naturalists and Gardeners by James B. Nardi. This is one of the best, most thorough and most completely enjoyable books I’ve read on, well, dirt. And everything that lives in dirt. The book is laid out in a very easy to understand and organized manner, much like the way we used to do an outline for a college course. It starts from the general (and most minuscule components of the soil) and moves progressively through to the more specific and larger inhabitants. The first of the three parts of the book explains how soil forms from rocks and organic materials through chemical and weathering processes. The second part is a wonderfully in-depth explanation and description of the inhabitants of the soil community and their relationships. The third part explains how we can become partners working to increase and maintain the health of the soil for the benefit of all without chemicals and to prevent many of the problems we have through erosion and the unfettered use of fertilizers. The author’s style is very engaging, often humorous, and I feel like he’s talking right to me. He clearly has deep affection and admiration for his subject and he conveys very complex information in a way that is easy to understand without sacrificing the scientific quality. One thing in particular I really like is that the soil community part introduces each new organism with a box that identifies its place in the taxonomic system, its place in the food web, its size and its impact on gardens. The illustrations and photos are great, too. This entry was posted in The Master Gardeners' Bookshelf and tagged ames B. Nardi, Life in the soil, soil. Bookmark the permalink.